Walking town, we can see cherry blossoms already in Japan! It is faster than usual year. blossoms more than cherry blossoms. Actually, I prefer “the trunk of the plum tree” rather than the actual plum blossoms (Laugh). “Red and White Plum Trees” is a famous painting by Ogata Kōrin, an Artist of the Edo period,and I have been excited by the charm of plum blossoms since seeing a kimono with a painted plum blossoms pattern. 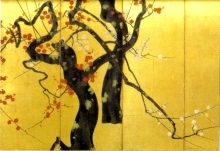 Plum blossoms in the Language of Flowers means “commanding beauty”. I even felt the word might come from the toughness of the trunk of the plum tree. By the way, do you know how to find out the difference between plum blossoms, peach blossoms, and cherry blossoms? In fact, these 3 blossoms are same kind of Prunus (Rosaceae). The blooming position on the tree and the shape of the petals helps tell these 3 blossoms apart. 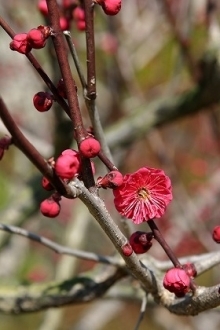 Plum blossoms grow on the branches, and the tips of the petals are round. 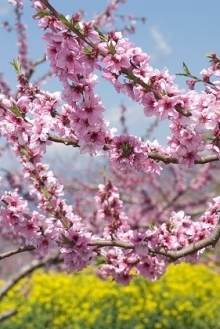 Peach blossoms grow along the branches, and the tips of the petals end in a sharp point. Cherry blossoms have a larger blooming area, as they grow in clusters of two to three on the branches and have a longer than average flower stem. It looks gorgeous. The tips of the petals have rough edges! ← April 6(Sat) 2013 Ohanami&Lunch party will be held! !